Do you love to read? I do. Business books are high up on my personal favorite list. Luckily, the Kindle and the iPad make it so super easy these days to find and enjoy new books. While I was returning home from a recent trip to London, the person sitting next to me on the plane asked me about some book recommendations. Why not share some ideas here on the blog? 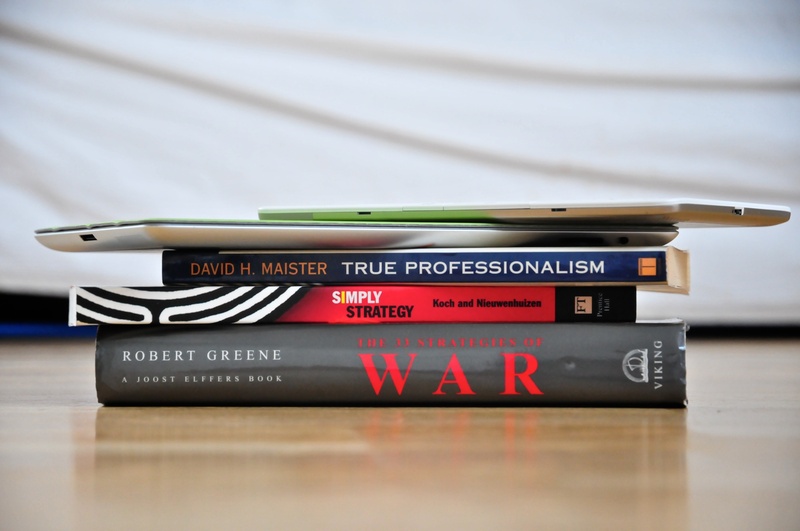 The following seven books belong to my current list of favorite books. All of these books have one thing in common: I keep coming back to them. The insights are either so profound and interesting or the book is that fun to read. Strategy is always a fascinating topic and but way too many books are too complicated and boring. This book is different. The authors break-down the strategy development process into simple steps and they provide two case studies to highlight how the principles work. It is really fun to read. You literally want to sit down after each chapter and try the different things out yourself. The authors have done a fine job. The design of book is a true eye-catcher as well. One of the first classic books about strategy was Sun Tzu’s ‘Art of War’. Managers around the globe have a copy sitting in their offices. This book goes much further: The author researched famous military strategies and develops several ideas that apply to modern businesses. What makes this book unique is the amazing storytelling. Author Peter Greene has collected a huge library of fascinating stories to highlight his points. This is a book you will pick up over and over again. The stories are that interesting. The title is a bit aggressive, but the content is amazing. Creativity is one of those areas that we tend to overlook when it comes to personal and organizational success. Many people think of themselves as not being creative. Yet, we admire creative people. This book takes a nice and sometime funny approach to teaching us how to be more creative. There are great exercises that will make you think. What does it take to be a true professional? What does it take to gain the respect of our clients and colleagues? Is it all about knowledge? The answer is “No”. This book provides amazing insights into what constitutes a ‘true professional’. David Maister, provides profound ideas and challenges to improve your overall market value and success. This is one of those books that can really change your career. My copy has traveled across the globe many times and I keep coming back to it. Death by Powerpoint? We have all sat through too many boring presentations. One bullet point at a time. And most of those presentations fail to grab our attention. Garr Reynolds proposes a different model. The old bullet-point presentations are outdated and need be replaced with a new presentation style. This book is really fun to read and it will change your perspective on presenting. Watch out: Once you have read this book you will be a different person. TQM, Six Sigma, BSC, Budgeting. Oh boy, there is no shortage in new management ideas. But do they all work? David Axson has written a fun book about various management practices. He uses hilarious storytelling to highlight some of the absurd situations we encounter in modern business life. You will really enjoy reading this book while also developing a critical eye that can help you pick the right practices for your business. But watch out: you will not be able to put this book down. We all spend a lot of time trying to sell ideas and messages. But it is really hard. Most ideas fail to inspire. Whether it is a new product, an idea for our next vacation, etc.. This classic book outlines what makes ideas sticky. The authors introduce a few principles that you need to be aware of and each one of them is highlighted through some seriously fascinating stories. The lessons apply to various aspects of our life. Be aware: The book will change the way you communicate. Have fun with this. If you want more ideas, feel free to check out my Amazon.com reading list as well. Happy Reading! P.S. : Many people ask me why I have a Kindle and an iPad. Here is why.